Dormant plant when soil temp. is below 50F. For your convenience, we have reproduced the new USDA Plant Hardiness Map. 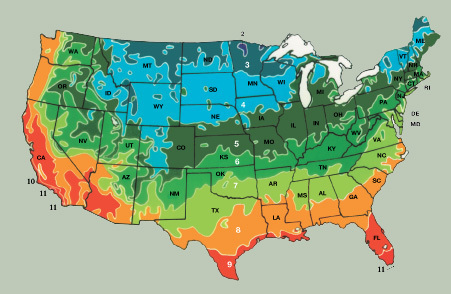 The hardiness zones are based on the average annual low temperature for each zone. Many factors, such as altitude, snowcover, degree of exposure to wind, proximity to bodies of water, excessive or minimal rainfall, soil types, etc. can create variations within zones. Please understand that these abnormalities can adversely affect your wildflowers. Thus, the spring and fall planting dates should be considered generalizations. The above factors have a dramatic effect on predicting precise sowing dates for each zone.